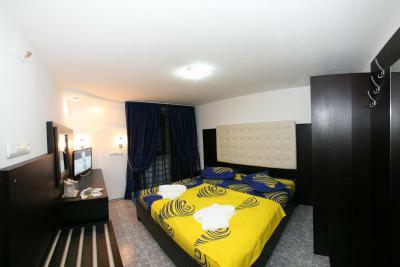 Lock in a great price for Pensiunea El Plazza – rated 8 by recent guests! 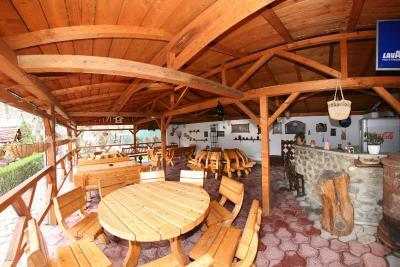 The property is big, with a very nice garden and swimming pool. 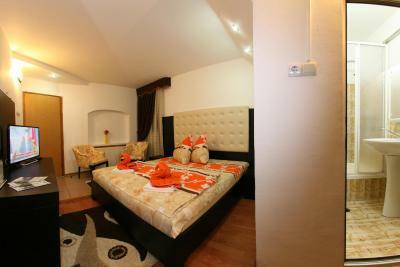 The room was clean and very comfortable, with a big balcony. Enjoyed that it was dark, so that we could sleep well, but for a longer stay maybe there would have been too little natural light. 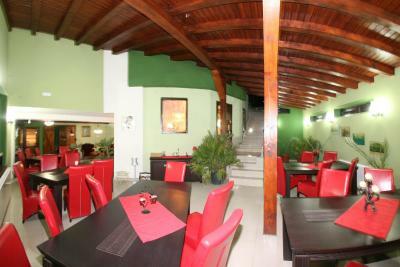 The location, the balcony, the design, all facilities. The garden, the room was welcoming and warm and the view was stunning. The staff is friendly and helpful. The food is very good and it comes in big portions and it is at reasonable prices, around, £5 a consistent meal. 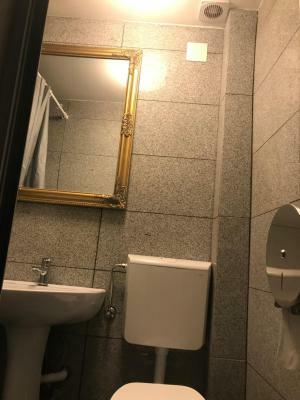 The place is clean and the photos are according to reality. The location is very close to the hiking paths. The view is wonderful! There was also a dog that was our guide on the mountain up to Retezat peak. Osmand app on the phone helps a lot keeping you on the path, as sometimes the signs on mountain are hard to find ; you need to download the Romania Mapp, it is free software. The internet works well! Thank you for making us feel welcomed! 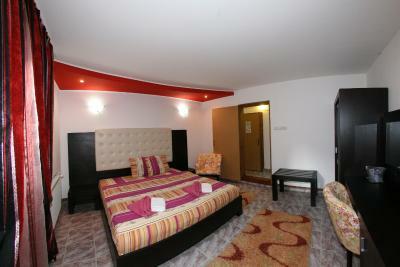 Room conditions were good and the staff was friendly. 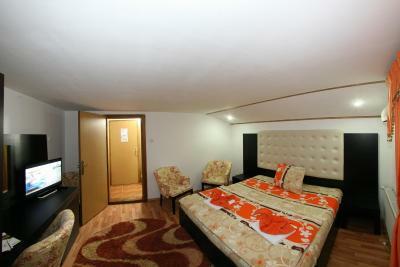 The apartment has two fain bedrooms, enough for regular family. 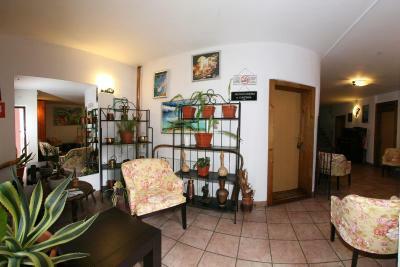 Owner was very friendly, place is very close to the city center. 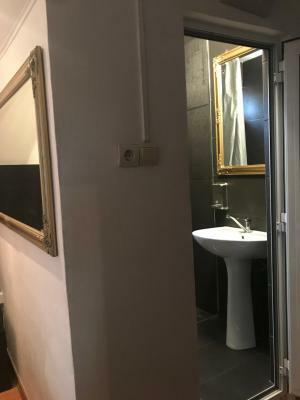 Pensiunea El Plazza This rating is a reflection of how the property compares to the industry standard when it comes to price, facilities and services available. It's based on a self-evaluation by the property. Use this rating to help choose your stay! One of our best sellers in Băile Herculane! Located in the center of Baile Herculane spa resort and offering a garden with a children's playground and basketball court, Pensiunea El Plazza features free WiFi. A sauna and a seasonal outdoor swimming pool are available for a fee. 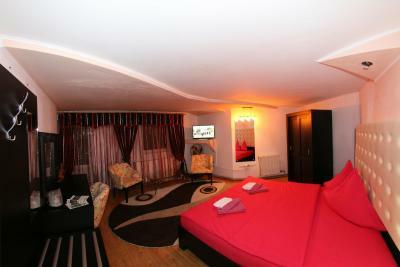 All rooms at Pensiunea El Plazza have a mountain view and come with a seating area, cable TV and a small refrigerator. Some rooms also feature a balcony. Private bathrooms are fitted with a shower. 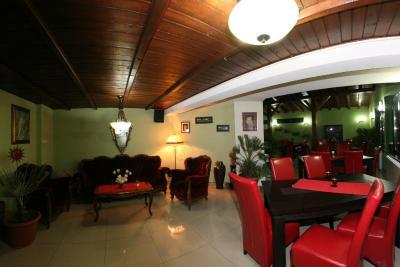 Guests can relax at the Pension´s bar. Weather permitting, dining on the outdoor furnished terrace is also possible. 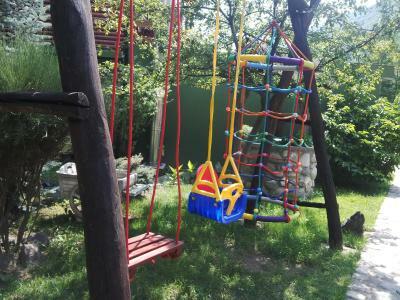 In the garden, a swing and a slide for children´s entertainment are provided. In the surroundings, hiking trails are to be found. After a long day, upon request and for an extra surcharge, a massage service can be arranged. 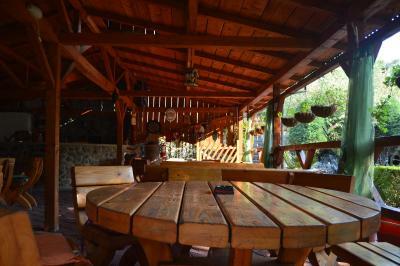 The nearest bus stop and the closest grocery store are a 5-minute walk from the property. The Thermal Public Pools are a 10-minute walk away. The Historical Center of Baile Herculane and the Baile Herculane Train Station are reachable within a 3-minute drive. Free private parking is available on site. 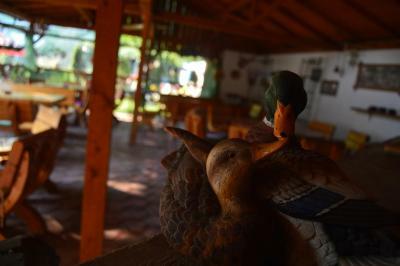 When would you like to stay at Pensiunea El Plazza? This suite features a balcony with a mountain view. 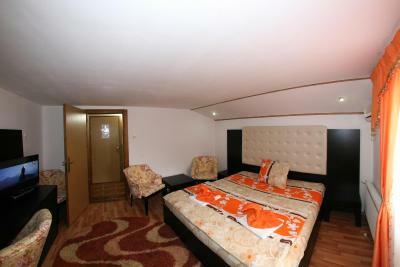 It has 2 bedrooms, a seating area, cable TV and a small refrigerator. 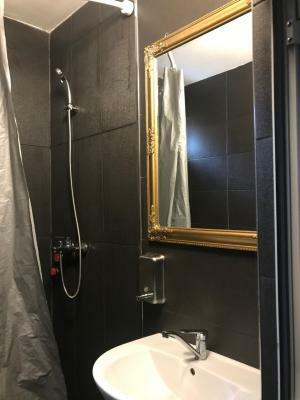 A private bathroom is fitted with shower. 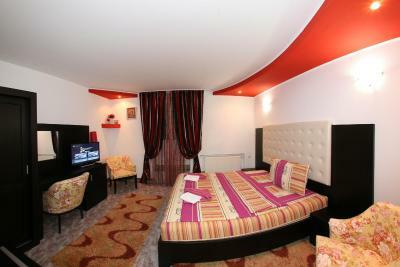 This double room features a balcony and a seating area. The room opens to mountain views. House Rules Pensiunea El Plazza takes special requests – add in the next step! One older child or adult is charged RON 37.27 per person per night in an extra bed. 1)The parking place 2)On the surroundings there are stray dogs and it's quite dangerous if you take a walk. Little bit hectic place, no bell or something at the reception. Bathroom was not clean. Upon our arrival, the receptionist checked us in and took us to room 10 (room with a balcony). We carried our luggages to the room and then we noticed that the balcony door couldn’t be closed. I informed the receptionist and asked to fix the door or change the room, as my wife was pregnant. She said she will call someone to come and fix the door. She rudely mentioned that there aren’t any rooms left and her attitude was completely unprofessional. The handyman, who arrived around 7:30, was drunk and tried to fix the door for almost an hour. After an hour, he gave up and came to the conclusion that the door cannot be fixed and placed a chair in front of it. He was rude and he mentioned that it will not be cold anyways, that it is just a small detail and that we are making a big fuss about nothing. But the cold was not the only problem. The room was just above the barbecue area and while he was fixing the door, the other visitors were lighting the fire and in a few minutes, the room was full of smoke. The receptionist left at 8PM and we repeatedly tried to call her, but she never answered. The door at the reception was closed. There was nobody that we could complain to or that could have solved our problem. Another thing worth mentioning is the fact that the room was full of mosquitoes and spiders. Worst customer service and worst accommodation ever! The location has an amazing view, however I wouldn’t recommend it. As minor drawbacks we would count the lack of enough natural light and the fact that the piping was exposed next to the doors' frames. The room was on a darker side and the sun did not reach the balcony. 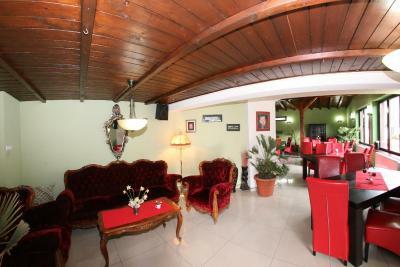 Overall the property is very nice , nice facilities and nice view. No hot water, for 4 days. We announced Reception the first day, but no fix and no appologies. It was unconfortable as we did long distance hikings every day and at return, we showered with cold water.